Dramatically and classically beautiful, the Eldorado Brougham presents an entirely new concept of motor car excellence. Its exclusive design and construction offer the highest expression of luxurious Fleetwood custom coachcrafting. The poise and bearing of the Eldorado Brougham ... its elegance and refinement are certain to place it among mans most prideful of all material possessions. Here indeed, is a motor car with distinction, grace and dignity that reflects ... far more powerfully than words ... the stature of those for whom it was created. In the Service Information leaflet, the 1959 Brougham was described as a distinguished member of the Cadillac family, incorporating a custom-built body on a standard 1959 chassis, and includes every advanced feature for comfort, convenience, luxury and performance. All equipment that is optional on other 1959 style Cadillac cars, such as Cruise Control, Air Conditioning, and Air Suspension, is standard on the Brougham. In exterior and interior appearance, the Brougham has a distinctive style of its own. A new rear deck, thin roof line and huge compound curve windshield set it aside from the other models in the range. Driving visibility is vastly improved by the3-feet-tall windshield that extends far into the roof. Specially tailored tail-fins accentuate the sculptured body sides. The classically simple lines of the 1959 Eldorado Brougham by Fleetwood, and particularly its lower tail fins, emphasize the exclusive character of this majestic motor car. They were a preview of things to come from Cadillac in 1960. Few ornaments are used. A small, chrome plaque bearing the words Brougham, by Cadillac on a blue enamel, cloisonné background, graces the front fenders just ahead of the front doors, above the chrome side spear. The 1959 and 1960 Cadillac Broughams are the last of the hand crafted cars, despite being production models, that is models included in the product catalogs for these two years. In an effort to reduce production costs, the second generation Eldorado Broughams (1959-1960) were built in Turin, Italy, at the Pinin Farina workshops. Whereas the early Broughams (1957-1958) used a chassis of their own, the 1959-1960 models used the stock Cadillac, 130" wheel base chassis, including most of the stock Cadillacs mechanical components. 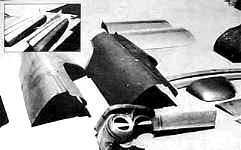 These included the floor pan, lower body interior panels, seat structures, instrument panel, dashboard, door pillars, hinges, inner door panels [these were modified but used stock hardware], lower front bumper, grille blades [but not the bullets, for a cleaner less cluttered look], headlamp bezels, rear wheel skirts, wheel covers and modified lower rear bumper. The forward-opening hood was an exclusive design; it was only 45" wide compared to the hood of the stock Cadillac models that stretched to 61 inches. 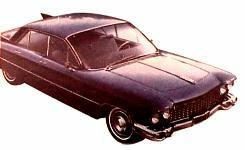 None of the body panels nor any of the glass could be interchanged with the stock Cadillac models. Narrow, chromed Cadillac crests dress the leading edge of the front fenders and the center of the lower edge of the trunk lid. A slim, stylized "Goddess", reminiscent of the type used on Cadillacs from 1953 through 1956, adorns the front hood. Equally slim chrome moldings outline all the glass areas. As far as styling goes, this car is, in my opinion, the Madame X of the post-war Cadillacs. The Cadillac chassis and other usable hardware [crated separately] were shipped to Genoa, Italy (located about 100 miles west of Turin). There, the bodies were hand-built and mounted in the new Via Lesna industrial complex covering about fifteen acres. 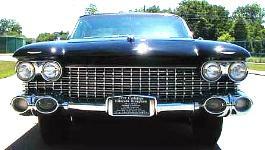 In his recollections about the 1959 Brougham, Pierre Ollier, who was closely associated with its design [and who owned two 59 Broughams in 1978], mentioned how it had taken three weeks of negotiation with the Italian customs before the Brougham clay models could enter the country; at that time, a law prohibited the import of plaster objects, to protect Italys statue industry. The Italian coach builder was commissioned by Cadillac to build one hundred Brougham bodies a year; Farina had to accommodate them in addition to other regular work his shop was doing for Alfa Romeo, Ferrari, Fiat and Lancia. The 1959 production totaled only 99 units while those of 1960 numbered 101. 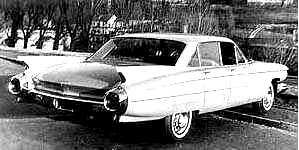 An unconfirmed rumor has it that one of the 1959 chassis was dropped in the harbor at Detroit, during loading operations for Italy, which may explain why Farina had to build one extra unit for 1960. 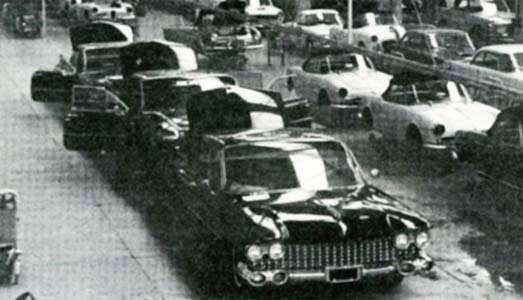 The Italian Cadillacs were individually built and assembled on a stationary production line. Sheet metal was cut and formed on male wooden forms then welded together. Seams were filled with lead. Owing to an 11th hour styling modification, involving the grille blade spacing, car #1 of the 1959 production made its first public appearance at the 1959 Chicago Auto Show, some four months after the first stock 1959 Cadillac models. That was not the only difficulty. Owing to the stylish but very narrow hood, and the fact that it was hinged at the front and not at the windshield, some simple service and maintenance jobs required the prior removal of the complete front bumper and grille assemblies (e.g. to remove and install the air suspension accumulator tank, which was a five-minute job on a standard 59 Cadillac)! Similarly, to remove a tail-light reflector and socket requires prior removal of the entire rear bumper! 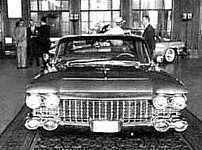 The completed cars were shipped back to Cadillac in Detroit for final finishing, trials and distribution to selected dealers. The first ones were available to the public starting in March 1959, whereas regular Cadillac models were available already in late Fall, 1958. 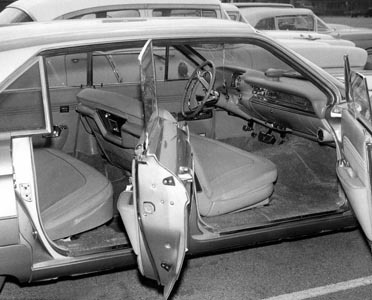 In the 1959 Brougham, when either rear door is opened, the quarter window slides back a couple of inches to allow more room for entry and egress. But, like the air-suspension system, this new gadget is prone to problems. Six pages are reserved for it alone in the Service Information booklet - not to mention additional service information included in monthly Cadillac Serviceman bulletins published after the 59 Brougham was released. The windshield measures a full three feet from hood to roof line, in the center. This sometimes causes annoying light reflections in the upper corners and while it keeps front seat passengers legs warm in sunny winter weather, it gently roasts them in summer, even with full A/C on. The unsightly windshield dog-leg "A" pillar is gone. 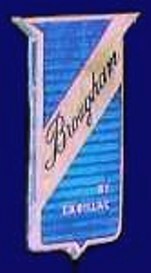 The 1959 Brougham prefigures a return to the former, more conventional "A" pillars. Two interior options are offered: full leather, with broad piping and buttons [image below, right], or a more plain soft fabric trim with a very narrow piped upper seat back and cushion front [image below, left]. The Florentine-grained leathers came in white, black, gray, blue, green and sandalwood. The broadcloth upholstery came in gray [below, left], blue, beige, green and tan covert. There is a complement of small storage compartments and warning lights. The instrument panel is a stock 1959 model with some additional knobs and controls for the many accessories. 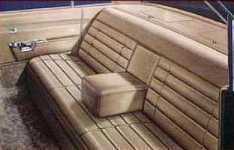 Not available in the 1959-60 Eldorado Brougham models was the former, complex memory-seat. 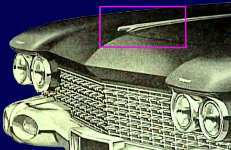 However, Cruise-Control was introduced by Cadillac this year and came as standard equipment on the Brougham. In addition an electric clock is mounted in the back of the front seat, in a highly polished walnut panel. 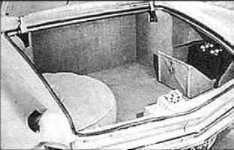 Unlike the early Broughams of 1957-58, the new 1959 models do not feature a fully power-operated trunk lid; there is only the standard electric trunk lid release. Although not as roomy as that of standard Cadillac models for 1959 is fully and plushly carpeted, with matching covers for the spare tire and battery. These are located at opposite sides of the compartment. From the picture, on the right, there does not seem to be room for lots of luggage, and particularly not for the bag of golf clubs so often featured in such publicity shots to demonstrate the roominess of the Cadillac trunk. The Brougham engine was the same as that used in the Eldorado coupe and convertible. It is a triple-carburetor version of the familiar Cadillac V-8, producing 345 hp at 4800 rpm. Rear axle ratio is 3.21-to-1. 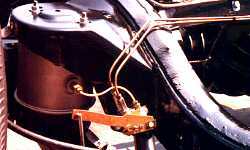 Air suspension was again used in preference to conventional coil springs. Owing to its superior weight and despite 20 added horsepower and lower gearing, the Brougham, on testing, did not perform as well a stock Series 62 sedan of the same year. With a 0-to-60 time of 11.7 seconds, it was in fact 1.4 seconds slower. 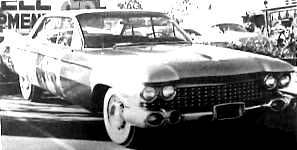 On the 1959-60 Brougham models Cadillac used a modified version of the air suspension system it had introduced in 1957. 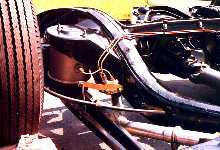 The latter used an electric air compressor that worked only when air was needed in the system; the 1959-60 cars have a belt driven compressor that supplies compressed air all the time the engine is running. A relief valve prevents too much pressure from building up. 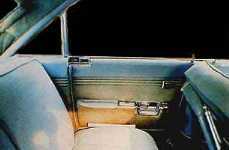 Sadly, Cadillac scrapped all NOS air-suspension parts in 1975, rendering them very hard to find. Current owners of these models may be interested to know that the leveling valves from post-1965 Fleetwood air shocks may be modified to fit the 1959-60 Broughams. Late seventies GMC motor homes used an air compressor similar to the one used in the 1957-58 Brougham models; conversion is possible. Ride is extremely smooth. The air suspension takes the jolt out of just about any surface (including railroad crossings) at any speed. Noise level in the Brougham is quite low. Aside from the air-conditioning blower, the hum of the tires on the pavement is about the loudest thing to be heard. The German Cadillac vendors, Müller & Hensel, offered a '59 Brougham [#69] for sale in MK, 6/1991 (p.55 - seen in HW coll.). For current news of that car, check out the "Survivors" page.